STAN HUDY - SHUDY@DIGITALFIRSTMEDIA.COM University at Albany fans rejoice as the Great Danes, a No. 12 seed in the NCAA women's tournament upset No. 5 Florida 61-59 at the Syracuse Carrier Dome Friday afternoon. 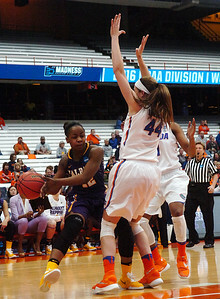 STAN HUDY - SHUDY@DIGITALFIRSTMEDIA.COM UAlbany's Cassandra Edwards (34) boxes out Florida's Ronni Williams Friday afternoon at the Syracuse Carrier Dome as UAlbany defeated Florida, 61-59 in the NCAA women's opening round. 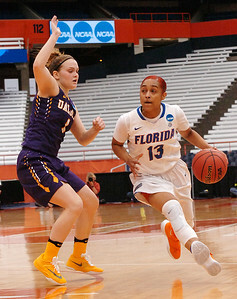 STAN HUDY - SHUDY@DIGITALFIRSTMEDIA.COM UAlbany's Imani Tate looks to pass the ball around Florida's Haley Lornzen Friday afternoon at the Syracuse Carrier Dome as UAlbany defeated Florida, 61-59 in the NCAA women's opening round. 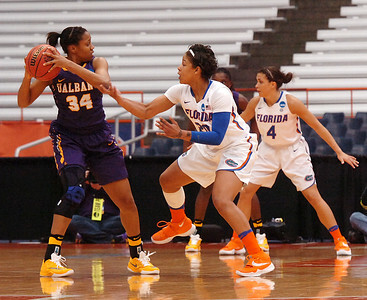 STAN HUDY - SHUDY@DIGITALFIRSTMEDIA.COM UAlbany's Shereesha Richards reaches in on Florida's Elenna Christinaki under the basket Friday afternoon at the Syracuse Carrier Dome as UAlbany defeated Florida, 61-59 in the NCAA women's opening round. 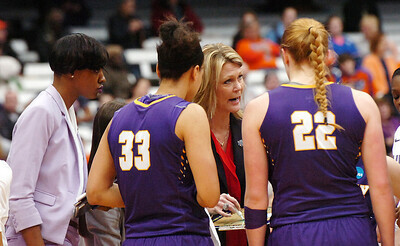 STAN HUDY - SHUDY@DIGITALFIRSTMEDIA.COM UAlbany coach Katie Abrahamson-Henderson talks to freshman Heather Forster (22) along with Tiana-Jo Carter (33) during a timeout with 18 seconds left Friday afternoon at the Syracuse Carrier Dome as UAlbany defeated Florida, 61-59 in the NCAA women's opening round, 61-59. 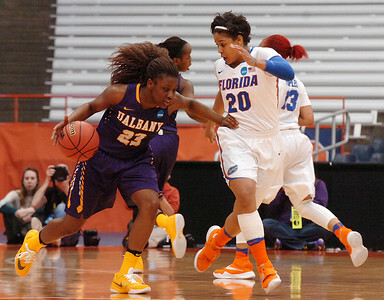 STAN HUDY - SHUDY@DIGITALFIRSTMEDIA.COM UAlbany senior Shereesha Richards drives towards the lane with Florida's Elenna Christinaki at her side Friday afternoon at the Syracuse Carrier Dome as UAlbany defeated Florida, 61-59 in the NCAA women's opening round. 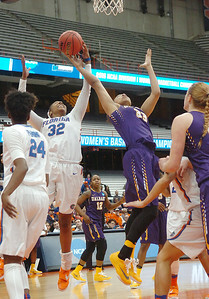 STAN HUDY - SHUDY@DIGITALFIRSTMEDIA.COM UAlbany sophomore Tiana Jo-Carter (right) goes up for a rebound against Florida's Carl a Batchelor Friday afternoon at the Syracuse Carrier Dome as UAlbany defeated Florida, 61-59 in the NCAA women's opening round. STAN HUDY - SHUDY@DIGITALFIRSTMEDIA.COM A University of Florida cheerleader performs during halftime Friday afternoon at the Syracuse Carrier Dome as UAlbany defeated Florida, 61-59 in the NCAA women's opening round. 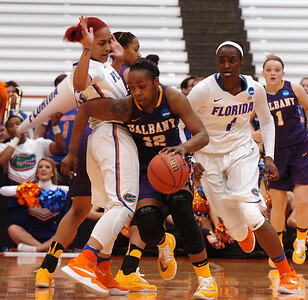 STAN HUDY - SHUDY@DIGITALFIRSTMEDIA.COM UAlbany's Zakiya Saunders looks for help, guarded by Florida's Isis Young Friday afternoon at the Syracuse Carrier Dome as UAlbany defeated Florida, 61-59 in the NCAA women's opening round. 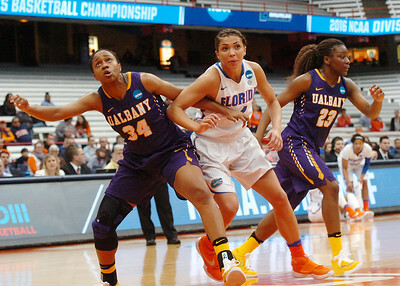 STAN HUDY - SHUDY@DIGITALFIRSTMEDIA.COM UAlbany's Shereesha Richards goes up for a shot, defended by Florida's Ty Fleming (24) and Brooke Copeland (23) Friday afternoon at the Syracuse Carrier Dome as UAlbany defeated Florida, 61-59 in the NCAA women's opening round. 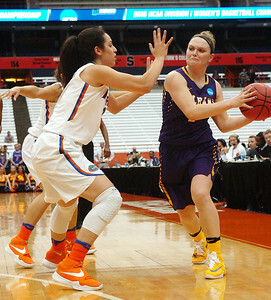 STAN HUDY - SHUDY@DIGITALFIRSTMEDIA.COM UAlbany's Erin Coughlin looks to pass the ball around Florida's Eleana Christinaki Friday afternoon at the Syracuse Carrier Dome as UAlbany defeated Florida, 61-59 in the NCAA women's opening round. STAN HUDY - SHUDY@DIGITALFIRSTMEDIA.COM A member of the University of Florida dance team performs Friday afternoon at the Syracuse Carrier Dome as UAlbany defeated Florida, 61-59 in the NCAA women's opening round. 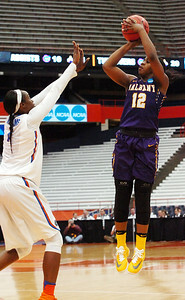 STAN HUDY - SHUDY@DIGITALFIRSTMEDIA.COM UAlbany's Zakiya Saunders fires up a shot in front of Florida's Simone Westbrook Friday afternoon at the Syracuse Carrier Dome as UAlbany defeated Florida, 61-59 in the NCAA women's opening round. 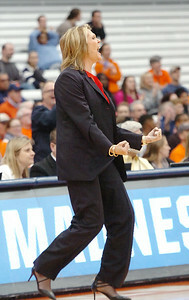 STAN HUDY - SHUDY@DIGITALFIRSTMEDIA.COM University at Albany coach Katie Abrahamson-Richardson with a joyful No. 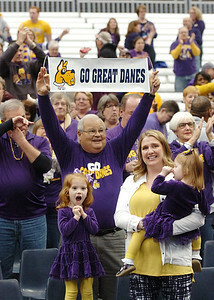 1 sign to the UAlbany fans as the Great Danes, a No. 12 seed in the NCAA women's tournament upset No. 5 Florida 61-59 at the Syracuse Carrier Dome Friday afternoon. 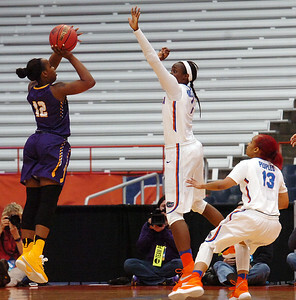 STAN HUDY - SHUDY@DIGITALFIRSTMEDIA.COM UAlbany junior Imani Tate (12) goes up for a turnover lay-up as Florids's Dyandria Anderson (11) looks to block the shot Friday afternoon at the Syracuse Carrier Dome as UAlbany defeated Florida, 61-59 in the NCAA women's opening round. 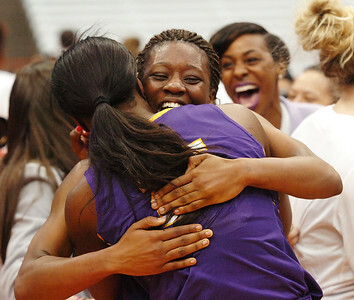 STAN HUDY - SHUDY@DIGITALFIRSTMEDIA.COM UAlbany junior Zakiya Saunders hugs senior Shereesha Richards after the Great Danes, a No. 12 seed in the NCAA women's tournament upset No. 5 Florida 61-59 at the Syracuse Carrier Dome Friday afternoon. 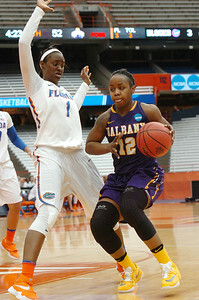 STAN HUDY - SHUDY@DIGITALFIRSTMEDIA.COM UAlbany junior Cassandra Edwards (34) looks to break away from Florida's Tyshara Fleming (24) and Elenna Christinaki (21) during the second half Friday afternoon at the Syracuse Carrier Dome as UAlbany defeated Florida, 61-59 in the NCAA women's opening round. 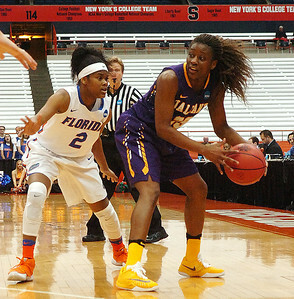 STAN HUDY - SHUDY@DIGITALFIRSTMEDIA.COM UAlbany's Imani Tate looks to drive past Florida's Ronni Williams Friday afternoon at the Syracuse Carrier Dome as UAlbany defeated Florida, 61-59 in the NCAA women's opening round. 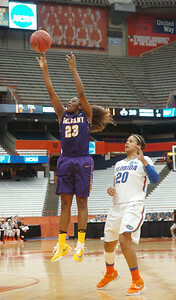 STAN HUDY - SHUDY@DIGITALFIRSTMEDIA.COM UAlbany's Imani Tate puts up a jump shot over Florida's Ronni Williams Friday afternoon at the Syracuse Carrier Dome as UAlbany defeated Florida, 61-59 in the NCAA women's opening round. 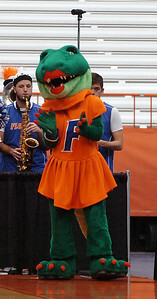 STAN HUDY - SHUDY@DIGITALFIRSTMEDIA.COM Florida mascot Alberta Gator claps during the first half of the 1st round of the NCAA tournament Friday, March 18 at the Syracuse Carrier Dome. 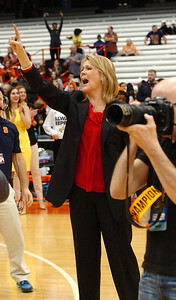 STAN HUDY - SHUDY@DIGITALFIRSTMEDIA.COM University at Albany coach Katie Abrahamson-Richardson celebrates after the Danes forced a turnover with 7.3 seconds left and took a 61-57 lead over Floriday Friday afternoon at the Syracuse Carrier Dome as UAlbany defeated Florida, 61-59 in the NCAA women's opening round, 61-59. 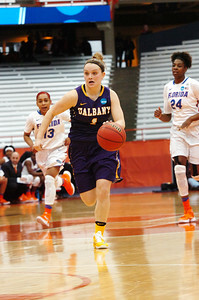 STAN HUDY - SHUDY@DIGITALFIRSTMEDIA.COM UAlbany senior Erin Coughlin brings the ball up the courst in the second half Friday afternoon at the Syracuse Carrier Dome as UAlbany defeated Florida, 61-59 in the NCAA women's opening round, 61-59. STAN HUDY - SHUDY@DIGITALFIRSTMEDIA.COM A member of the University of Florida dance team performs duirng the second half Friday afternoon at the Syracuse Carrier Dome as UAlbany defeated Florida, 61-59 in the NCAA women's opening round. 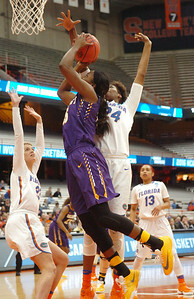 STAN HUDY - SHUDY@DIGITALFIRSTMEDIA.COM UAlbany's Imani Tate looks to jump over Florida's Simone Westbrook Friday afternoon at the Syracuse Carrier Dome as UAlbany defeated Florida, 61-59 in the NCAA women's opening round. 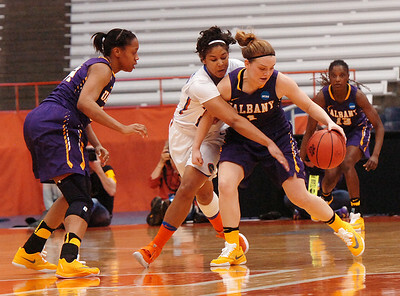 STAN HUDY - SHUDY@DIGITALFIRSTMEDIA.COM UAlbany's Heather Forster (22) looks to block out Florida's Haley Lorenzen (44) and Simone Westbrook (20) Friday afternoon at the Syracuse Carrier Dome as UAlbany defeated Florida, 61-59 in the NCAA women's opening round, 61-59. 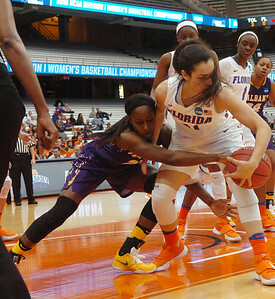 STAN HUDY - SHUDY@DIGITALFIRSTMEDIA.COM Florida's Simone Westbrook pressures UAlbany's Cassandra Edwards in the first half of the 1st round of the NCAA tournament Friday, March 18 at the Syracuse Carrier Dome. 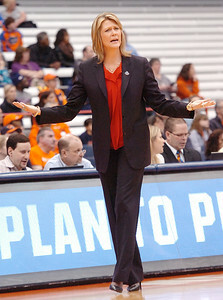 STAN HUDY - SHUDY@DIGITALFIRSTMEDIA.COM UAlbany coach Katie Abrahamson-Henderson is puzzled by a call from the referees in the first half of the 1st round of the NCAA tournament Friday, March 18 at the Syracuse Carrier Dome. 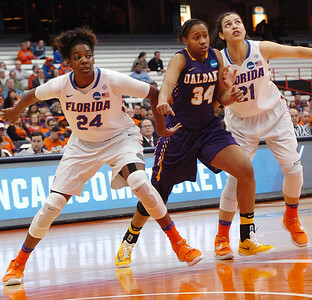 STAN HUDY - SHUDY@DIGITALFIRSTMEDIA.COM Florida's Simone Westbrook is boxed out by UAlbany's Cassandra Edwards (34) and Zakiya Saunders (23) during the first half of the 1st round of the NCAA tournament Friday, March 18 at the Syracuse Carrier Dome. 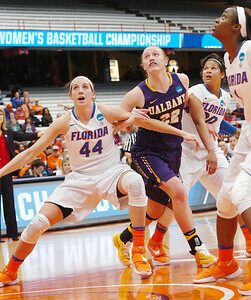 STAN HUDY - SHUDY@DIGITALFIRSTMEDIA.COM UAlbany's Erin Coughlin looks for help after picking up her dribble and is gaurded by Florida's Simone Westbrook during the first half of the 1st round of the NCAA tournament Friday, March 18 at the Syracuse Carrier Dome. 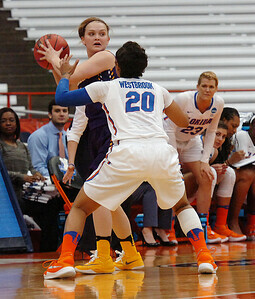 STAN HUDY - SHUDY@DIGITALFIRSTMEDIA.COM UAlbany's Erin Coughlin guards Florida's Cassie Peoples in the first half during the 1st round of the NCAA tournament Friday, March 18 at the Syracuse Carrier Dome. 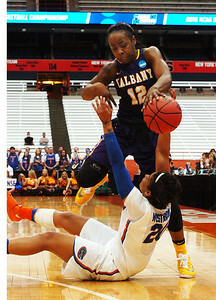 STAN HUDY - SHUDY@DIGITALFIRSTMEDIA.COM Florida's Simone Westbrook (left) reaches in on UAlbany's Erin Coughlin during the 1st round of the NCAA tournament Friday, March 18 at the Syracuse Carrier Dome. 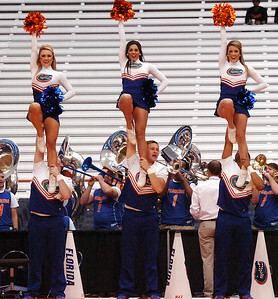 STAN HUDY - SHUDY@DIGITALFIRSTMEDIA.COM Members of the Florida Gators cheerleading squad reach new heights during the first half of the 1st round of the NCAA tournament Friday, March 18 at the Syracuse Carrier Dome. 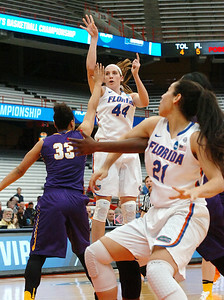 STAN HUDY - SHUDY@DIGITALFIRSTMEDIA.COM Florida's Haley Lorenzen puts up a jumpe shot over UAlbany's Tina-Jo Carter (33) in the first half of the 1st round of the NCAA tournament Friday, March 18 at the Syracuse Carrier Dome. 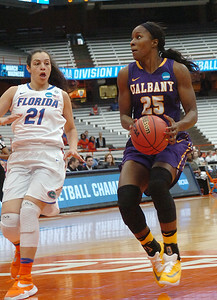 STAN HUDY - SHUDY@DIGITALFIRSTMEDIA.COM UAlbany's Imani Tate looks to move around Florida's Cassie Peoples during the first half of the 1st round of the NCAA tournament Friday, March 18 at the Syracuse Carrier Dome. 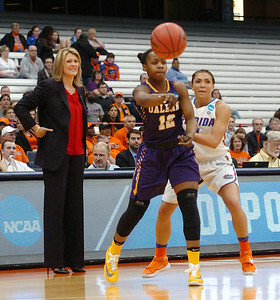 STAN HUDY - SHUDY@DIGITALFIRSTMEDIA.COM UAlbany's Imani Tate passes the ball back towards the baseline in front of the Great Danes bench and Coach Katie Abrahamson-Henderson in the first half of the 1st round of the NCAA tournament Friday, March 18 at the Syracuse Carrier Dome. 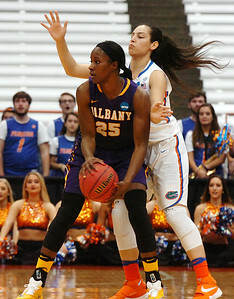 STAN HUDY - SHUDY@DIGITALFIRSTMEDIA.COM UAlbany's Sheeresha Richards (25) is guarded by Florida's Elenna Christinaki during the first half of the 1st round of the NCAA tournament Friday, March 18 at the Syracuse Carrier Dome. 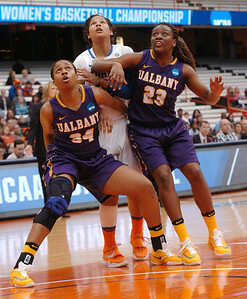 STAN HUDY - SHUDY@DIGITALFIRSTMEDIA.COM UAlbany's Tiana-Jo Carter cradles the ball after a first half defensive rebound during the 1st round of the NCAA tournament Friday, March 18 at the Syracuse Carrier Dome. 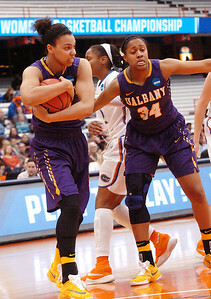 STAN HUDY - SHUDY@DIGITALFIRSTMEDIA.COM UAlbany's Zakiya Saunders looks to move Florida's Simone Westbrook in the first half of the 1st round of the NCAA tournament Friday, March 18 at the Syracuse Carrier Dome. STAN HUDY - SHUDY@DIGITALFIRSTMEDIA.COM Members of the Florida Gators spirit squad perform during the first half of the 1st round of the NCAA tournament Friday, March 18 at the Syracuse Carrier Dome. 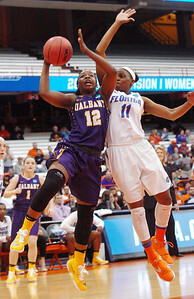 STAN HUDY - SHUDY@DIGITALFIRSTMEDIA.COM UAlbany's Imani Tate over Florida's Ronni Williams in the first half of the 1st round of the NCAA tournament Friday, March 18 at the Syracuse Carrier Dome. 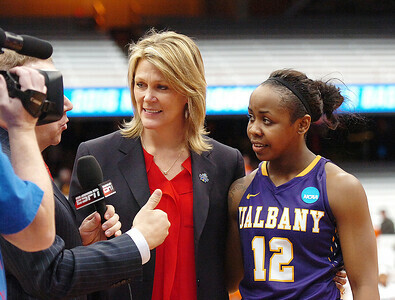 STAN HUDY - SHUDY@DIGITALFIRSTMEDIA.COM To thw winners go the interviews with ESPN as UAlbany coach Katie Abrahamson-Henderson and Imani Tate are interviewed after the Great Danes, a No. 12 seed in the NCAA women's tournament upset No. 5 Florida 61-59 at the Syracuse Carrier Dome Friday afternoon.